Bottle gourds are ready for harvest. 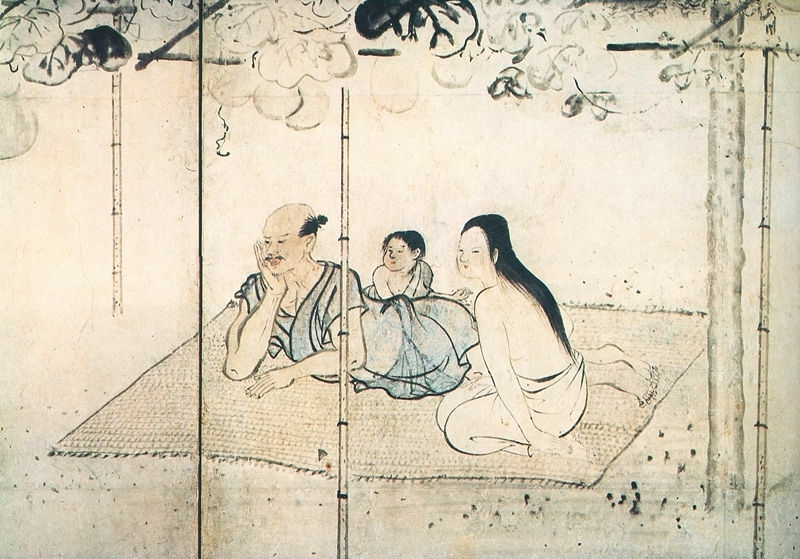 National treasure "Family Enjoying the Evening Cool(夕顔棚納涼図屏風)" painted by Kusumi Morikage is in the possession of Tokyo National Museum. It is a two-fold screen with a height of 149.7 cm and a width of 166.2 cm. Many people feel that it's too simple as a national treasure. A simple pergola is covered with bottle gourd. A farmer's family is enjoying exposure to cool air in the evening under it, staring at something. 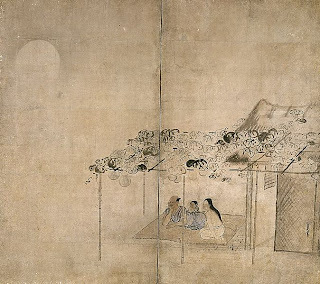 This painting is interpreted as representing happiness in little things. However, the painter's family broke up easily. 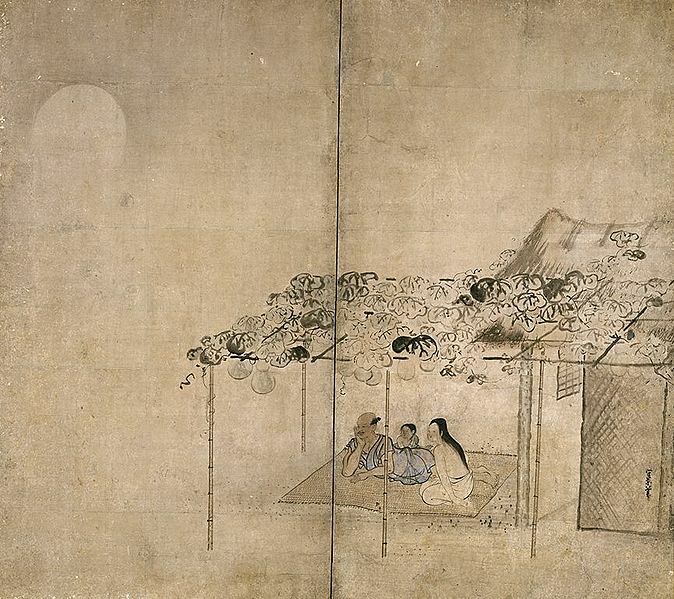 Kusumi Morikage (c.1620-1690) was a Japanese painter of the Edo period. Not much is known about his background. His date of birth and death, his birthplace and deathplace are unknown. He became a pupil of Kanou Tanyu(狩野探幽) who was a famous painter of the Kanou school. He was reputed to be one of the big four painters belonging to the school and he married Tanyu's niece. He enjoyed a moment of glory. However, his son and daughter sullied luster. Although both of them were pupils of the Kanou school, his daughter ran off with her fellow pupil, his son got expelled from the school due to his womanizing and unjustified resentment against his senior pupil caused him to injure the pupil by stabbing. His son was finally banished from Edo. Morikage distanced himself from the Kanou school and headed for Kanazawa. His best known works including this picture were painted there. Ironically, the bad behaviors of his children led him to establish his original style. 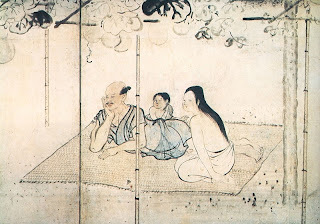 Some say that the three persons presented in the painting are Morikage, his son and daughter and he projected his memory of a happy time in the past onto the painting. His daughter became a painter and we can see her work at a museum, but her talent was nothing compared to Morikage's. This painting was designated as a national treasure in 1952 because Kusumi Morikage depicted Japanese farmer's life affectionately although most painters in those days modeled after Chinese paintings. Hyoutan(瓢箪:bottle gourd),also known as hisago or fukube, is frequently used in making Japanese confections as a motif representing early autumn.